then I upgraded to the Cannon Ixsus 60, and then the Powershot SD1100 IS . From all three Cannons I would recommend only the later – Powershot 1100. But, I have come across a better camera from Panasonic, a manufacturer which is not always associated with cameras, like Cannon, but I can assure you that this Panasonic I’ve worked with is way better than all 3 Cannons I’ve listed above. For me, this photo sums up the abilities of this camera. I took it in NYC from a ferry while on the move. I was seating on the far side of the ferry aiming from inside, and into the window where the two girls are. I had something like a second, not more to take the shot as the Statue was moving from one side of the frame, to the other. Notice how the camera made all its calculations accurately, and it made it fast. Knowing the Cannon, I can almost be sure, that the Powershot or SD, would not be fast enough to take that kind of picture, resulting in either a bad focus or just a window with two girls , without the Statue of Liberty. Another thing is the different light areas the camera coped with successfully – there’s me seating in a shaded area, aiming at a few objects with different light, indoors and outdoors as well. Also, the Lumix has a 10X optical zoom, which is great. It allows you to take photos of far away objects without sacrificing quality. 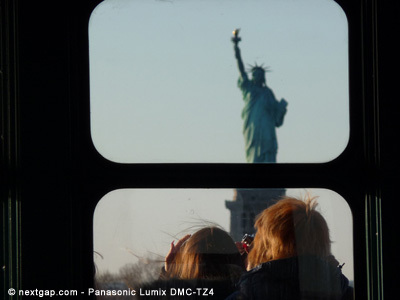 The Lumix has the ability to shoot in several modes, including MANUAL. MEGA Optical Image Stabilization helps prevent blurring from hand-shake; Intelligent ISO Control helps prevent motion blur; and Face Detection helps produce clear portraits by optimizing the focus and exposure settings. The Lumix is also comfortable in hand. 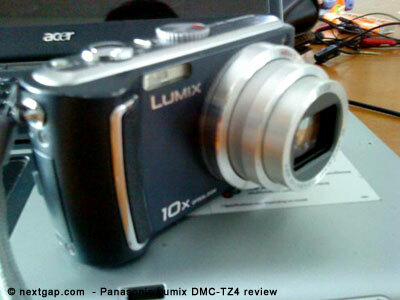 It’s basically the same technology and quality as the TZ4, only with 10MP and 12x optical zoom, and also a Wide Angle.